Assist public safety and public service agencies with carrying out their responsibility of protecting lives, property, and the environment. 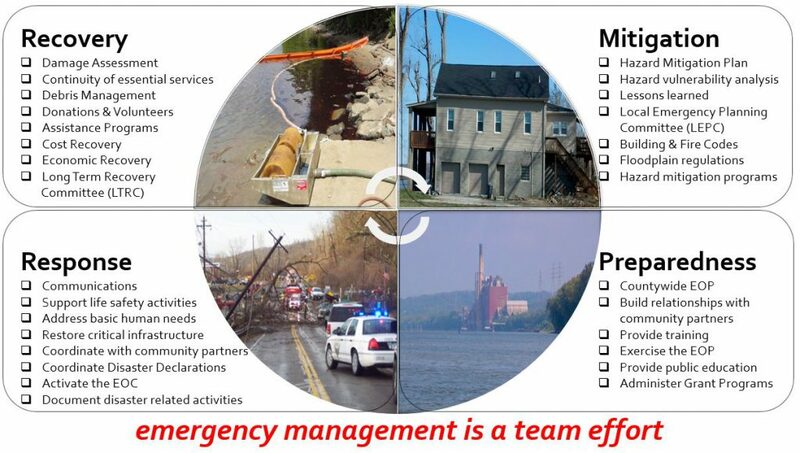 The Clermont County Emergency Management Agency has created COOP Guidance to assist local government agencies, non-government agencies, and private sector partners with developing a continuity of operation plan. Continuity of operations is the ability to continue essential services during and following an emergency or disaster. Minimize loss of life, injury, and property damage. Reduce or mitigate the length and severity of disruptions that do occur. Achieve timely and orderly resumption of essential functions and the return to normal operations. Protect essential facilities, equipment, records, and assets. There are 10 key elements that should be addressed in the continuity plan. Essential Functions/Services – enable an organization to provide vital services, exercise civil authority, maintain public safety, and sustain the industrial or economic base. Orders of Succession – provide for orderly assumption of leadership roles during an emergency, in the event that officials are unavailable to fulfill their legal duties. Orders of succession should be three deep. Delegation of Authority – formal documents that specify the activities that can be performed by those authorized to act on behalf of the key officials during a continuity event. Organizations should have a clear line of succession in the absence of existing leadership and the necessary delegation of authority to ensure that succeeding leadership has the legal and other authorities to carry out their duties. Continuity Facilities – alternate or back up facilities that sustain essential functions or services. Organizations should identify adequate locations to ensure continuity of operations. Communications – the capability (including: hardware, software, and trained personnel) to communicate critical information with staff, external stakeholders and media and the technology requirements to sustain essential services. Communication strategies should be redundant, operational within 12 hours, and sustainable for up to 30 days or until normal operations are resumed. Vital Records Management – the ability to identify, protect and access electronic and hardcopy documents, references, and records required for the sustainment of essential services. Human Capital – the people required to sustain essential services. Personnel should be cross-trained and vertically trained to be able to perform the functions of their peers and those above and below them in an emergency. Planning considerations include: identifying essential personnel; identifying roles for non-essential employees; establishing alternate work procedures (e.g. teleworking); communicating information to employees; and establishing management practices for continuity events. Training and Exercises – educating staff on continuity plans and procedures will reduce confusion and anxiety during a real-world event. Devolution – is the capability to transfer statutory authority and responsibility from the agency’s primary operating staff/facilities to alternate employees/facilities in the event that the continuity personnel/facilities are unavailable. Reconstitution – the process of restoring normal operations at a permanent location. © 2019, Emergency Management Agency. All Rights Reserved.